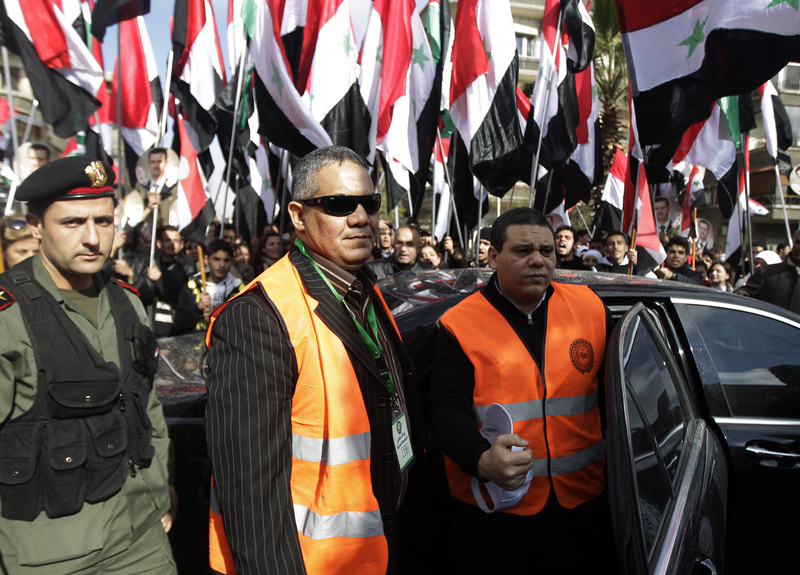 A word in defense of the Arab League observers in Syria. They were getting bad press before they even set foot on Syrian soil. The joke about them might have gone like this: "How many Arab League observers does it take to change a light bulb? -- None, because they're not serious about seeing anything." However, as an observer of the observers - I can tell you many of them did a conscientious job, and they made a difference just by showing up. Syria slams Arab League's "conspiratorial plot"
First, as the observers prepared to fan out across the country, the Syrian military did move most of its heavy weapons - including tanks - out of the city centers. The horrifying assault on civilian neighborhoods by battlefield artillery largely stopped. Second, one condition of the observer mission was that the Syrian government would allow foreign reporters into the country to work freely - in other words, to talk to anti-regime activists and protesters without being tethered to Ministry minders. The Syrian government agreed, grudgingly. In our case, having growing tired of minders breathing down our necks and eavesdropping, we complained to one of the Arab League mission chiefs, when a Syrian Interior Ministry official happened to be standing right there. "Is it true these reporters are not being allowed to travel and work without surveillance?" she asked him sharply. "But of course not," he replied, embarrassed. "They can go where they want. They just have to sign a form taking responsibility for their own safety. The country is full of terrorists, you know." It was the answer of a man cornered in front of an influential witness. The mention of terrorism and safety was probably meant to scare us, but we called his bluff. The next day, having signed an absurd letter saying we were venturing out at our own risk, we had no more trouble with minders. It's also worth mentioning that the Syrian military never stopped us from going through any of their checkpoints, even when we were headed into Damascus' most violent suburb, Douma. The observers were a mixed bag. Some of them were incompetent, frightened, uninterested. Others were excellent. I can't mention names, because they were forbidden from making any public statements while the mission was underway. The good ones quickly realized they could be human shields for reporters, and courageously led the way into opposition areas that would otherwise have been too dangerous or off-limits. They braved gunfire to talk to both sides in besieged towns. They composed careful lists of prisoners allegedly released under a presidential amnesty, then diligently followed up to make sure all got home safely. Some didn't, and that was noted too. Through their work and cooperation with the media, the world finally began to get an accurate and balanced look at the reality of Syria's uprising. Not all the observers were as dedicated, however. We slipped into a neighborhood in the town of Deraa, where the uprisings began last March. It remains paralyzed by angry demonstrations and gun battles between state and opposition forces. "You came, but the Arab League didn't bother," the people told us as they paraded their wounded. Military deserters hid among the poor concrete houses. We found the Deraa team of observers at a nearby hotel, but when we approached they escaped, shielding their faces. The generational divide that's been so obvious during the Arab Awakening may have split the observer mission too. In most cases - not all, but most - older observers were the least proactive and determined. It was the younger ones - human rights lawyers, military officers, physicians - who stood out. Bravely and carefully, they gathered much hard evidence that could be used to steer both the Syrian government and the international community toward a peaceful solution to this crisis. If what they have to offer is instead whitewashed or ignored by cynical political agendas - inside and outside the Arab world - it will not be their fault.